Do you struggle with the removal of stubborn spots, water streaks and dirt build-ups from your windows? Do they cost you too much elbow grease and you don't want to take part in this housework? This process will no longer consume a lot of your time and energy! The experts of window cleaning in Limehouse will give you a hand! You will be able to use your spare time as you wish – the fully instructed and dependable professionals will take care of the wiping and scrubbing. We deliver careful cleaning services for all types of windows. Read on and discover more about the different benefits you can get. We also provide our professional services in nearby areas: Stepney, Haggerston, Mile End, Ratcliff, Whitechapel. We use the most exceptional procedures to make sure that you get the best window cleaning. With our water-fed extension pole system and jet washing technique, you will enjoy spotless look of your windows. We connect our poles to water reservoirs in our vans to ensure that there is no risk for the exterior of your dwelling or business premise. For high-rise windows, we use entirely secured rope access method. You can profit from these cleaning techniques now – just call 020 3746 3113! With our know-how and technical proficiency, you can rely on us for household and commercial window cleaning. Your home will look amazing after the work is done, no matter what type of windows you have. We clean single, double or sash windows, French doors, bay windows and patio doors. In addition, we clean garden windows, skylights and conservatories. In other words, you can depend on us for complete cleaning of your windows, including the framework and ledges. Improve the look of your property – the professionals of commercial window cleaning will deal with that. As part of our distinctive service, we use water-fed extension poles. With this technique, we can clean thoroughly the windows of your business premise, up to the fourth floor. In order to reach highly-rised windows we use rope access. We guarantee your glass panes will look perfect, regardless how high is the building. With the assistance of the team of experts London's skyline shall never be filthy. 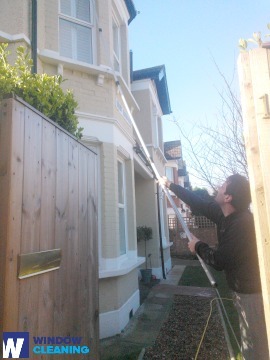 With our quick and efficient domestic window cleaning in Limehouse, you will enhance the look of your home at once. We utilise purified water for inside and out cleaning of your windows. We make this possible by using ground based water-fed extension pole system, which is safe both for your home and the cleaners. Learn more – get in touch with us on 020 3746 3113 or complete our online booking form. For your convenience we have a chat option. Our operators are available 24/7 – you will receive answers to your questions. You can be one of our happy customers now!